Specialists have unique electronic health record (EHR) needs for clinical documentation and care coordination with other specialties, subspecialties, primary care, and other care settings. Historically, very few specialists have adopted EHRs, but that’s changing with the advent of specialty templates and modules optimized for specific specialties, such as ophthalmology and dermatology. EHR options for multi-specialty groups are also evolving and gaining adoption in certain specialties. This section provides EHR and health information exchange guidance for specialists. Refer to the Health IT Playbook’s Certified Health IT section for more information on the role and benefits of certified health IT functionality and capabilities. Refer to the Privacy and Security section for information on privacy and security standards; permitted access, uses and disclosures of health data; preparing for audits; and tips for cybersecurity. Integrating health IT into behavioral health care can improve care coordination and patient outcomes. The information and resources in this module will help you adopt and implement health IT in your practice. For example, documenting and following individuals’ preferences, promoting active and informed participation tailored to their abilities, attending to their emotional needs, and supporting their autonomy can establish rapport and increases the likelihood that they will engage in treatment. Strategies including education, communication, and shared decision-making approaches can generate positive health outcomes. Refer to the Playbook’s Patient Engagement section for fact sheets, research briefs, strategies, and up-to-date information on initiatives and trends for patient engagement. 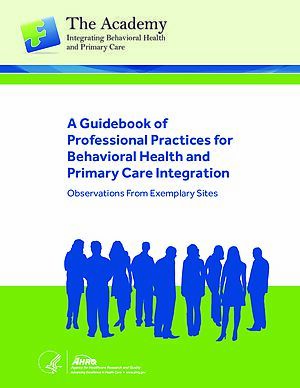 As primary care is often the gateway for individuals to address their behavioral health needs through their primary care clinician (PCP) and, as a result, more PCPs are offering integrated behavioral health care services. This presents unique health information exchange challenges due to confidentiality rules surrounding sensitive health information. Behavioral health information — such as psychotherapy notes, substance abuse treatment records, and psychiatric diagnoses — legally qualifies as sensitive health information. In addition to federal regulations, individual states may have specific laws for disclosing or exchanging sensitive information. EHRs and health information exchange solutions are evolving in their ability to best capture and segment sensitive health information to facilitate use of health IT to better manage and coordinate care. To protect behavioral health information, it is important to understand the federal and state laws that govern the privacy of health information. State health information privacy and consent laws and policies vary widely across the U.S., and may impose additional requirements. Learn more about state health IT privacy and consent laws and policies [PDF - 442 KB]. Refer to the Playbook’s Privacy and Security section for tools, resources, references, and information on protecting the confidentiality, integrity, and availability of medical information. 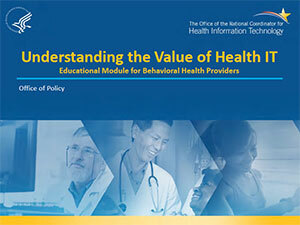 Behavioral health information exchange (HIE) expands access to health information necessary for comprehensive patient care, but requires adherence to the laws referenced above as well as additional considerations for consent management and establishing patient and clinician trust. Refer to the Playbook’s Health Information Exchange section for tools and information on secure HIE, learning guides, and case studies for HIE in behavioral health. Recent studies demonstrate the positive health effect and benefits provided by virtual counseling, including convenience, privacy, fewer missed appointments, increased access and choice, and customizable care.17, 18, 19, 20 Moreover, with a shortage of primary care and specialty behavioral health care clinicians,21, 22 telebehavioral health can link individuals in areas with staffing shortages or mobility limitations to clinicians in other geographic areas. Virtual behavioral health sessions provide control over privacy and can reduce stigmatization when receiving care at home or another convenient location. Telebehavioral health involves specialized technologies, software, and devices. Integrating telemedicine and telehealth services requires a critical understanding of regulatory and legal bounds, licensure requirements, and privacy and security standards. Refer to the Playbook’s Telehealth section for resource links to national organizations and agencies including CMS, ONC, AHRQ, Center for Connected Health Policy (CCHP), the American Telemedicine Association, and the Telehealth Resource Center. 8 Kessler, R., & Stafford, D. (2008). Primary care is the de facto mental health system. In Collaborative medicine case studies. (pp. 9-21). Springer New York. 9 Robinson, P., & Reiter, J. (2007). Behavioral consultation and primary care. Springer Science+ Business Media, LLC. 17 Godleski, L., Darkins, A., & Peters, J. (2012). Outcomes of 98,609 US Department of Veterans Affairs patients enrolled in telemental health services, 2006–2010. Psychiatric services, 63(4), 383-385. 18 Wagner, B., Horn, A. B., & Maercker, A. (2014). Internet-based versus face-to-face cognitive-behavioral intervention for depression: a randomized controlled non-inferiority trial. Journal of affective disorders, 152, 113-121. Pediatricians — both primary care and pediatric subspecialists — also face unique challenges in the areas of functionality, documentation, and privacy when it comes to implementing and using health IT. Pediatric practices also deal with specific privacy requirements around parental involvement for adolescents and consent, or for custodial, foster, guardian, or adoptive care. Below you will find a key resource to support pediatric practices’ electronic health record (EHR) implementation and optimization, and health information exchange participation. We plan to expand this section over time, so check back periodically for additional resources. Have suggestions for making the Playbook better? Please share your feedback with us. Use health IT to support specialty care delivery, coordination, and documentation. Do you have a tip or suggestion for using health IT to support specialty care that's worked well in your practice? Share it here!